PDF pages/forms on the AFRMA site requires Adobe Acrobat Reader. 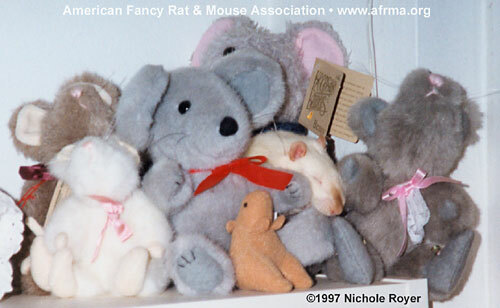 This article is from the Winter 1997 AFRMA Rat & Mouse Tales news-magazine. You never know what will turn up on your doorstep. One evening this past June, it happened to be three of the neighborhood kids. This normally wouldn’t be a noteworthy occurrence (the neighborhood “rugrats” frequently stop by to visit the critters); however, on that particular day they brought a rat with them. The kids quickly filled me in. Apparently, some of their friends had been playing ball in their front yard earlier in the day. The ball rolled under a bush, and when they crawled under after it, they found this little guy. Their parents said, “No rats,” so they gave him to the kids on my block. Their parents said, “No more rats,” so they brought him along to me. While talking to the kids, I was noting just what kind of condition the little rat was in. I knew that the temperature had been hitting well over 100 degrees all week, and that day had been a scorcher. To be quite honest, the little guy looked like he was on death’s doorstep, and I was concerned that he might be suffering. I don’t believe in lying to kids, so I told them up front that the rat was in very bad shape, and it might be kindest to put him down. They weren’t very happy, but said that they didn’t want him to suffer, so to go ahead and do what I thought was best. After each one gave him a pat, they handed him over. Once in my hand, the little guy briefly (and unsuccessfully) attempted to struggle to get to his feet. He then calmly lay in my hand, looked me over, and began scouring my hand with his tongue. Kiss, kiss, kiss, kiss. Very surprised I thought, “Okay, at least he has a little spark left in him.” Heart melting, I went ahead and set up a cage for him, hoping I was making the right decision. For the first 24 hours he did nothing but eat and drink. He even slept sitting up holding a lab block in his mouth. A couple hours after being put into the cage, he wobbled to his feet. Since he was looking a little perkier, I took him out to take a close look at him. On close examination, I discovered that he was, in fact, a male, and a Himalayan (the dark smudge on his nose was unmistakable). I also found that he was in the end stages of molting, putting his true age at around 6 to 8 weeks instead of the 3 weeks he looked. He was extremely dirty, which I figured was normal for a white critter found lying under a bush, until I noticed all the specks of dirt were moving. The little rat was covered with the worst mite infestation I have ever seen on an animal. Yuck! Thank goodness for that little bottle of Ivermectin that sits in my critter first aid kit. I needed something to get rid of all these crawlies before they spread, and this little rat just was not strong enough to stand up to a bath. One drop of Ivermectin behind his ear and the mites were gone in 2 hours. Repeated again 2 weeks later, and the crawlies have never been back. From the beginning I vowed that this little rat was not here to stay. Just as soon as he was well, I was finding him a new home. My resolve quickly crumbled. He just quite simply was one of the friendliest rats I had ever been around. If you got anywhere near him, he would shower you with kisses, or wrestle with your hand. By the time the Orange County Fair came around, I realized there was no way I would part with him. After all, how much difference is one rat going to make? My only dilemma was a name. Usually, I have no problem naming my critters, and often times they name themselves. This little guy was giving me a problem however. I just could not find a name that seemed to “fit.” I was stumped. Then it occurred to me. We needed critters for our display at the fair, and there were probably a bunch of people there who might be willing to help me name my rat. Off to the fair he went, and while he kissed, played with, and generally won the hearts of all our volunteers who helped run the AFRMA booth, fair visitors filled out their suggestions on what to name him. After thoroughly enjoying the fair, not to mention all the attention, my little rat was probably somewhat disappointed to come home. I was excited though, since I was finally going to give this guy a name. I dumped out the can, and was staggered by the number of suggestions it held. I expected a few, but 493?? It was a tough decision. All the names were wonderful, and it was hard to pick just one. 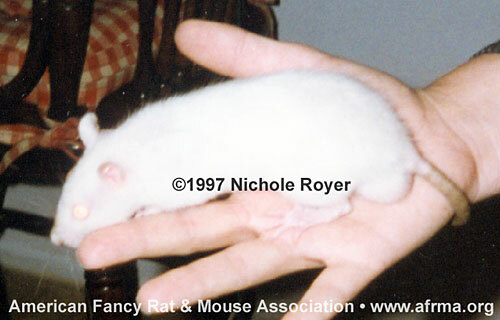 There were many names you would expect for a white rat: Snowball, Snowflake, and Snowy among others. There were also people names like Bob and Josh. One of my favorites was Yeti, which I thought was perfect for a Himalayan, but just not quite right for my little rat. In the end it came down to three choices: Hobo, Vagabond, or Chance. Hobo didn’t seem quite right, and Vagabond seemed too big a name for this little guy. Chance fit just right, so Chance it is. Chance is now my bedroom rat. He is probably one of the friendliest and most affectionate rats I have ever had the pleasure of owning. Though he will always be very small, Chance is healthy, and the only sign of his ordeal other than his size, is that he is missing half an ear. I often contemplate on just how he ended up under a bush. Though I will never know for sure, I can take a fairly good guess at the answer. Rather frequently someone will purchase a rat, then decide they no longer want it. Since they don’t want it around, they simply take it outside and turn it loose. Needless to say, the rats often die a rather horrible death. Despite the fact that food, water, and shade are all abundantly available in my neighborhood, Chance almost died. Domestic rats are just that—domestic. They are not equipped to survive in the wild. Fate brought me Chance, but I can’t help thinking of all the others that don’t make it to my doorstep. AUTHOR’S NOTE: I do not know why I am still surprised, but it always amazes me the number of people who are not willing to be responsible for their own animals. I receive several calls a month from people who have gotten tired of their pet rats, want to get rid of them, and think its my responsibility to take them. There are also usually a number of rats in shelters desperately needing new homes. All text, artwork, and photos are copyright to AFRMA, and/or the author, artist, or photographer. Unauthorized copying of any part constitutes a breach of copyright law.